Mimosa (Albizia julibrissin), also known as the silk tree, is a fast-growing, deciduous tree with a life span of 10 to 20 years. The tree is named after Filippo degi Albizzia, who was the first to bring mimosa out of Asia in 1749. Mimosa is a member of the Fabaceae or pea family, a large group with more than 16,000 members. The tree is high-maintenance and not for everyone, but the gardeners who are willing and able to give the tree the time and attention it needs are rewarded with a spectacular flower show. The mimosa tree grows from 15 to 40 feet tall with an open, airy crown spread of 20 to 50 feet. Lacy, delicate, fern-like, compound leaves grow up to 20 inches long and are made up of leaflets that measure under 2 inches long. Fragrant, silky, pink, 2-inch-wide pompom flowers bloom from late April to early July and are a favorite nectar source for bees. Flowers are followed by brown, hard fruits from 3 to 6 inches long. Botanists have developed different varieties of the original tree. Alba is a variety with white flowers, Rosea (Ernest Wilson) is a hardier version has bright pink flowers and only grows from 10 to 15 feet tall. Mimosa is hardy in USDA zones 6b through 9. Plant in full sun and a moist, well-drained soil. Partial shade is an option, but the tree performs best in full sun. The tree is drought and salt tolerant. 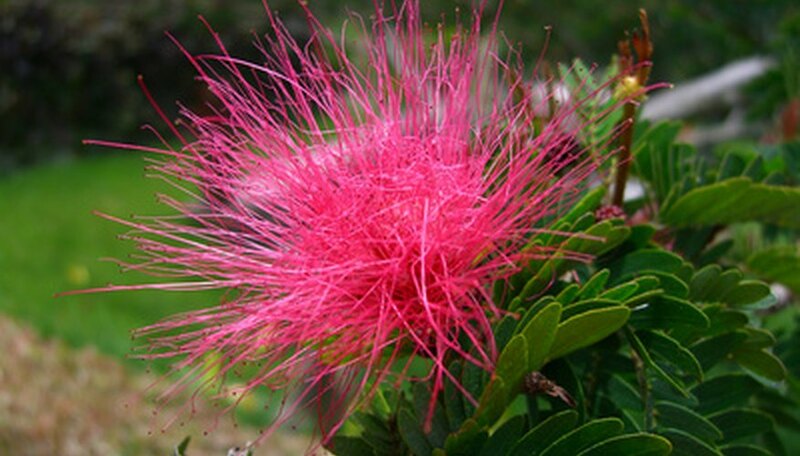 The mimosa tree is a native of Asia, ranging from Iran to Japan. In the United States, the tree is found growing wild in the Southeast and in California. Use mimosa to provide shade for a terrace or patio. The tree is also used as a specimen plant for a front lawn. Fruit and twigs cause a litter problem. The bark is thin and damage results from being hit with a lawnmower. The litter problem and the drooping habit of the branches make the tree a bad choice near sidewalks. The tree’s roots grow close to the surface and get under sidewalks, lifting them up. Mimosa (vascular) wilt is a fatal, contagious disease. There is a disease-resistant variety of the tree available. Cottony cushion scale, mites and the mimosa webworm attack the tree. The tree is considered an invasive species in watershed areas.